Looking To Plan The Ultimate NYC Yacht Wedding? While there is no shortage of wedding venues in New York City to choose from, when it comes to truly interesting, and uniquely special NYC venues, everyone’s pretty much “been there, done that” with all the area churches, synagogues, temples, hotels, ballrooms, and “traditional” wedding venues in New York City. 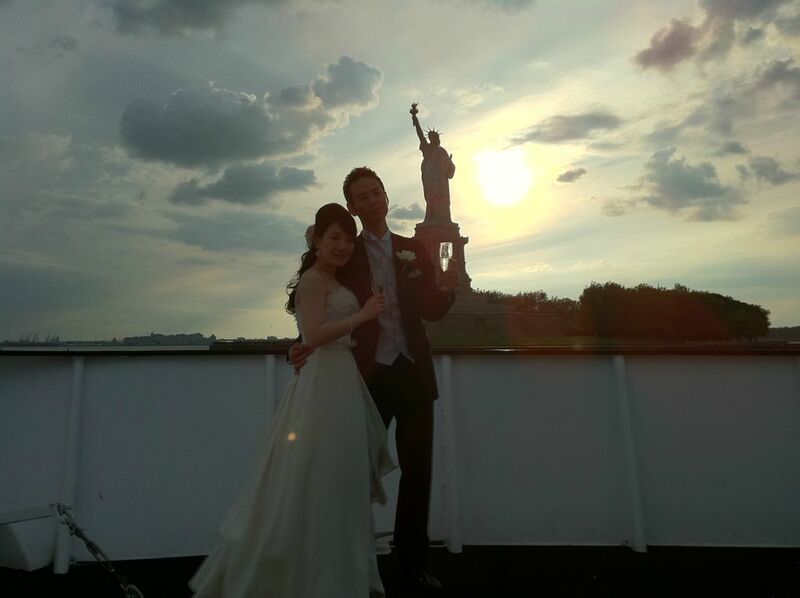 Change things up with a dream like Yacht Wedding overlooking the beauty of NYC! If you’re looking for something extraordinary and truly different — a private luxury yacht or boat wedding in the New York City Harbor is the ticket! It’s a supreme way to ensure your special wedding night will be filled with everlasting memories of unprecedented luxury and the breathtaking beauty of NYC. Our resident NYC Yacht wedding planners will professionally plan the ultimate yacht wedding. 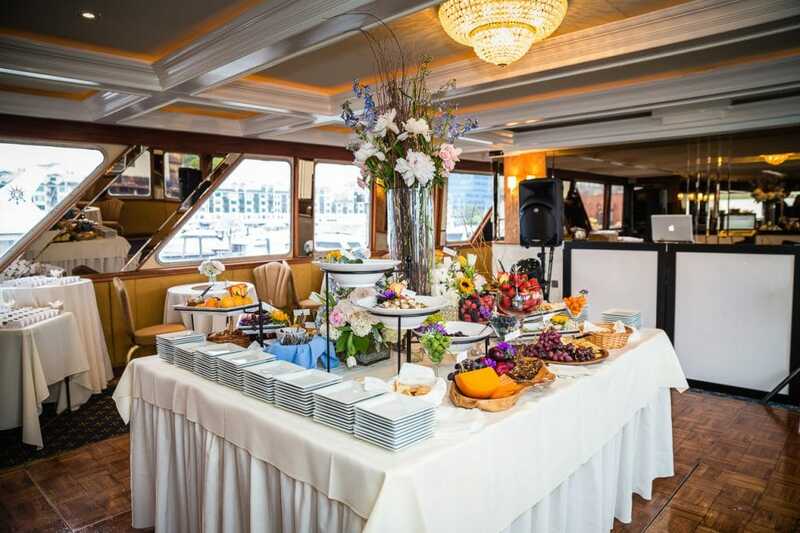 We include everything from your bridal shower, rehearsal dinner, reception and wedding; – all from aboard the NYC yacht charter of your dreams. 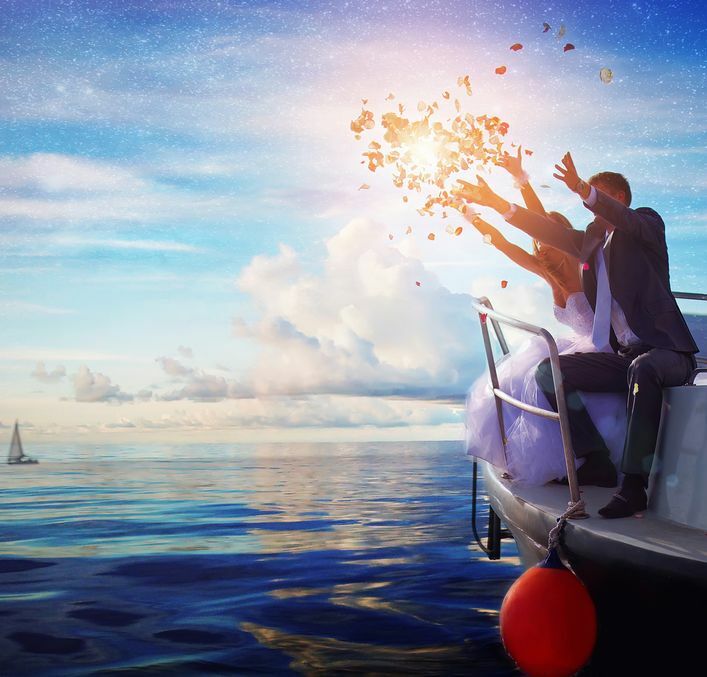 Having a luxurious yacht wedding in NYC also allows you to provide a custom designed atmosphere, complimented by panoramic views, selective cuisine, world class entertainment and service. As soon as you and your yacht wedding guests feel the surrounding luxury, elegant decor and royalty like treatment from your very own professional event staff; you’re going to feel captivated beyond your wildest imagination. New York Harbor is ideal for charter yacht weddings — providing spectacular views of NYC at any time of year and every time of day. From New York’s early morning in the springtime to the late evenings of fall, you can set your wedding to a backdrop of iconic bridges, the Statue of Liberty and Ellis Island, the instantly-recognizable skyline of Manhattan and more. Not only does a yacht wedding in NYC give you the ultimate unique wedding venue, it also comes with many of the products and services you’ll need, greatly simplifying your wedding planning. No, weddings hosted on yachts aren’t cheap. But when comparing NYC wedding venues, be sure you’re comparing apples to apples. For example, most of the churches and hotels that offer wedding services do not include any of the other wedding vendors — like catering, florists, wedding themes and decorations, and entertainment. When you price those wedding venues, you’ll have to add all those costs on top of that. But when you opt for a NYC wedding charter yacht with Yachts For All Seasons, you’re getting an all-inclusive price for themes, decorations, a venue for both the wedding and the reception (not to mention the ultimate photo venue! ), the catering, and the entertainment you wish to use. We provide a variety of services from live bands to casino games so that you can match your entertainment perfectly to your wedding style and guest list. Yachts For All Seasons offers nearly 60 NYC charter yachts to choose from, meaning you can perfectly match the yacht to the type of wedding you want (traditional or modern, formal or informal), and match the size of the vessel to your guest list. If you desire to have a grander sized NYC yacht wedding, you don’t have to crowd your 1200 guests into a boat designed for only a few hundred people, and you don’t have to rent a gigantic yacht designed for hundreds when you only want to invite 50 of your closest loved ones; that is of course unless that is what your heart so dreams for. The wedding planners at Yachts For All Seasons can help you match the right vessel to your wedding ideals and guest list. 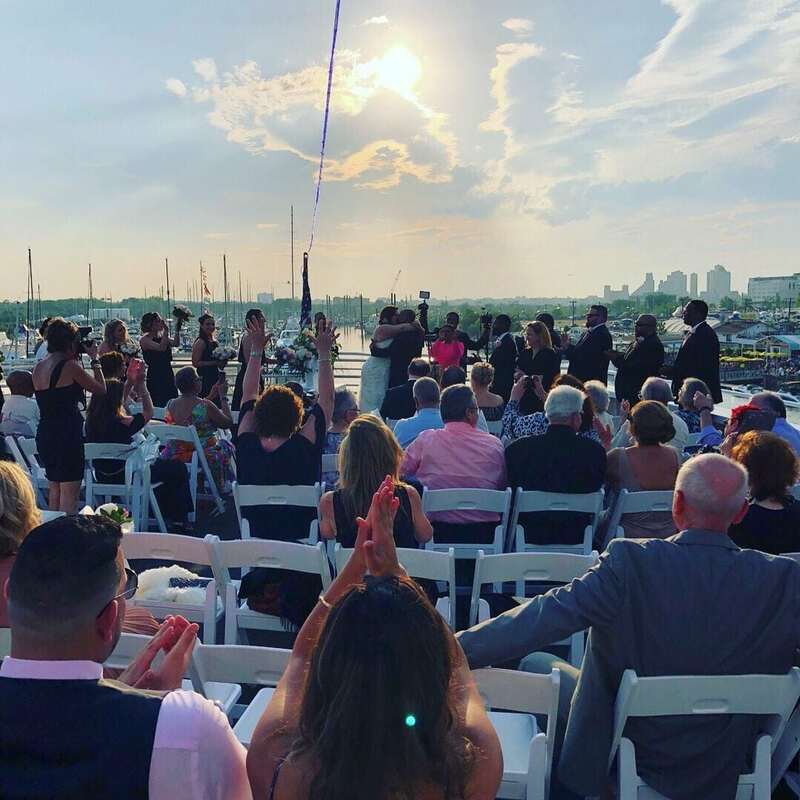 Having a yacht wedding in NYC also gives you amazing flexibility in choosing your officiant and how religious (or non-religious) you want your ceremony and vows to be. For example, some couples just don’t feel “married” if a minister or rabbi didn’t officiate. Others want to steer clear of the religious altogether, opting for a family friend or other officiant to oversee their vow exchange. On a boat, you aren’t restricted the way you might be in some of the religious NYC wedding venues. Hey, your cousin can get her license to marry on the Internet and perform the ceremony, if you like! Just Think How Beautiful Your Wedding Photos Will Be on a NYC Charter Yacht! Have you considered the wedding photo opportunities on a NYC charter yacht? Any time of year, you can get stunning photos of you guys with the area’s most famed bridges in the background, as well as sites like Ellis Island and Manhattan. For fall weddings, you might consider a cruise up the coast toward Connecticut for some spectacular shots of the foliage in full color. Winter brings the festive lights and decorations (and some really cool-looking ice around the harbor, if the season is cold enough). Summer gives you the opportunity to dress in delightful sleeveless wedding dresses and opens up endless possibilities for the bridesmaids’ dresses! Just picture yourself aboard the yacht of your dreams as you dance the night away around the beautiful New York Harbor; cruising under some of New York’s landmark bridges with lights brilliantly illuminated around you. The countless stories that can unfold will be endless! As the many past wedding couples will tell you, getting married on a yacht in beautiful NYC was the experience of a lifetime their hearts so longed for. If you’re spending the rest of your life with your chosen loved one, wouldn’t you want your special day to be one for the ages? We think so too! Maybe a charter yacht isn’t ideal for your wedding, because the groom gets seasick or the bride’s mom has her heart set on you guys marrying in the church. That doesn’t mean you have to give up on your dreams! Yachts For All Seasons also hosts bachelor and bachelorette parties, bridal showers, rehearsal dinners, and reception dinners. Contact Yachts for All Seasons to begin planning your perfect yacht wedding NYC day now! Our professional wedding planners are standing by. Yachts For All Seasons Inc.
Have Questions on how Yachts For All Seasons can plan your dream yacht wedding in NYC? Simply submit a FREE QUOTE REQUEST and one of our senior NYC wedding planners will follow up to provide a complimentary Wedding consultation. CURRENT SPECIALS! Book Your New York City Yacht Wedding on the Water Today and Take Advantage of our Current Savings!